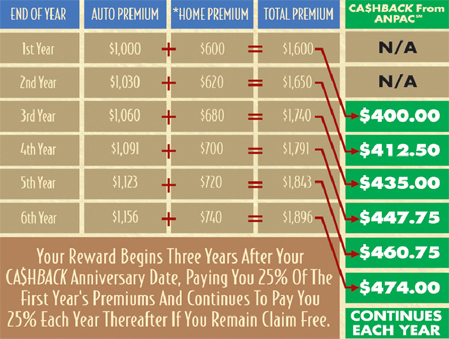 Our CA$HBACK from ANPAC® program rewards you by refunding a portion of your first-year combined auto and homeowner premiums when you remain CLAIM-FREE for three consecutive years from your CA$HBACK anniversary date. *Earthquake, equipment breakdown, and Secure I.D. From ANPACSM endorsement premiums are not included in the homeowner premium. HOWEVER, if you should have a loss, rest assured that ANPAC® will be there when you need us! In fact, the majority of our customers rate our claims service as excellent - the highest category.